A small yellow plane soars through the sky and is immediately spotted as the beloved Piper Cub.The Cub is a basic, no-frills aircraft that has dominated the marketplace because it is extremely reliable and versatile. It has excellent low speed manners and it can take off and land where other planes cannot. The Cub’s big brother, the Super Cub is considered by many as the ultimate backcountry airplane. The Piper J-3 Cub was first introduced to the public in the late 1930s. This high-wing two-seater quickly became the top seller in the private plane market. In the 1940s, the Cub became the primary training plane in the Civilian Pilot Training program during World War II. The L-4 Grasshopper, a military version of the Cub, flew observation and liaison missions throughout the war. Then in 1946, demand for the Piper Cub was higher than ever. The war was over and returning military pilots were ready to embrace the American dream. 6,000 Cubs were sold that year, which is still the record for the most civilian aircraft of one type manufactured in a single year. Over the years, Piper Aircraft has created many popular models, such as the Piper Cherokee, Arrow, Aztec and Malibu. One of the easiest to spot and classic Piper Aircraft are the beloved yellow Piper Cubs. Today, the Cub is recreatedby CubCrafters (Carbon Cub, Sport Cub, and Top Cub) and by American Legend Aircraft (Legend Cub, which is offered in J3 and PA11 styles). 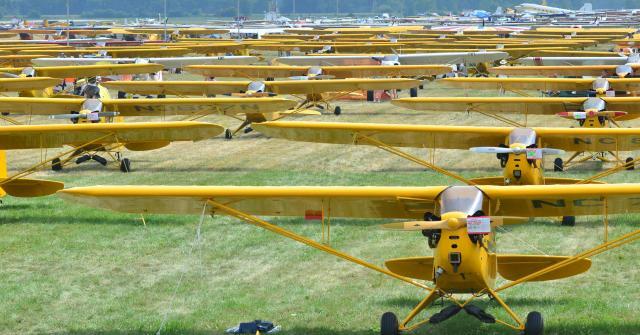 The Piper Cub and Aviation Insurance Resources (AIR) have one thing in common. Pilots everywhere love the Piper Cub. “Flies like a Cub” is still one of the greatest compliments a pilot can give an aircraft. And pilots everywhere love the aircraft insurance options at AIR. We offer the broadest package of protection at the best available rates. We represent all of the major aviation insurance markets and are licensed in all 50 states. To find out more about Piper Cub Insurance, please contact Aviation Insurance Resources by calling 877-247-7767 or visit AIR-PROS.com today to receive your free Aircraft insurance quote! You can also follow us on Facebook, Twitter, LinkedIn, Pinterest, and Google+.